I wanna glow but I don’t wanna look like a disco ball. I’ve made so many errors in my beauty life with shimmer and glitter it’s downright embarrassing but I had fun along the way and that’s all that matters right? Beauty is about fun and most important evolution as you always have the chance to change your look thanks to a few color cosmetics and thus you’ll evolve and create something new, fresh, and exciting along the way. I still haven’t mastered the use of highlighter yet but I adore and collect highlighting powders, the irony right? 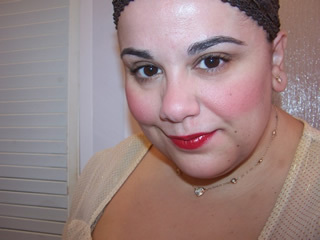 I’m trying to master the use of Tarte Maracuja Blush & Glow which is a new product from Tarte for Spring. This is a two step system which includes cream cheek tint and highlighter all in one. The tube is designed with a small dome cream cheek tint on the top half of the packaging. You simply unscrew the clear plastic top and swipe the cream blush on cheeks. The tube contains liquid cream highlighter which you can apply a touch of after the tint. I think the ratio of blush versus highlighter is a bit off as you get a heap of highlighter here, at least 1 oz, versus the smaller cheek tint…you’d think it would be reversed. More blush, less highlighter. One thing I dislike about the packaging is the cream blush doesn’t swivel down so when I place the top back on I have to be very careful I don’t slice off a chunk of it. The two products both have a soft, hydrating feel on skin. This is a good thing for those with a less than smooth surface to work on or those with drier skin because the product applies beautifully with an easy, smooth glide across cheeks. I find even on my patchy, dry areas it looks fresh and flawless. The formula has a knack for not accentuating my drier areas. This could be due to the hydrating maracuja oil in the formula. The cream tint is of medium pigmentation and builds easily for more pop. The formula has a hint of shimmery metallic to it but it blends out to a nice, even glow. The highlighter also has hints of a metallic finish as well with a good deal finer sparkle in the mix. I find the highlighter (like all highlighters) is very easy to over do. You have to be super careful during the application of the highlighter particularly if you’re as heavy handed as I am. A little will give a soft glow to face but alot will be quite a glitter-fest. Below I’m wearing the color Sunlight on my cheeks. I applied the tint all over my cheeks and blended. I followed up with a little of the highlighter on the top of my cheek bones. You’re not limited to how you can use the highlighter as it’s easy enough to apply on your brow bone, on lids for a very soft wash of color, or on certain areas of your face and cheeks. Or even add a few drops to your foundation for an allover glow. Overall, I’m still trying to get a knack for using Tarte Maracuja Blush & Glow, I’m a little scared of over doing it but if you’re an advanced highlighter user you’ll absolutely adore these. The product gives skin a soft touch of candle lit glow that’s very pretty and flattering for Spring. Candlelight is so beautiful! I would love to mix the highlighter liquid with some BB cream (the uber matte-greyish ones that are kind of duds in my stash) to give it some glow. Great review and FOTD as always. You are spot on about beauty being fun or else what’s the point in buying the products? Even if we make “mistakes” according to the beauty gurus the other women out there are all walking around worried about how THEY look anyway so it doesn’t matter. cheers michelle that makes me feel brilliant *hugs* we all make mistakes but it’s fun and how we learn ;D! Sunlight is really pretty color, but I have a feeling the blush would be enough shimmer for me, sans the highlight. My oily skin makes me glow a bit too much as it is. call of the disco “oo oo ah ah OO OO AH AH” I’ve gone out many times looking like a disco ball myself! the light in the bathroom is so much dimmer than than the rest of my life. I just started getting into highlighting, I just see how that goes, have a ton until the perfect one is found. that’s like trying to find the perfect red lipstick *sigh* which I finally have! the rest of the reds are in the lipstick bag feeling sad for themselves because they just aren’t as perfect as the perfect one. Nice. I will be trying Candlelight. Thanks for the preview and swatches! I’ll definitely be checking these out. Thanks for the review! Hi Muse! Just wanted to let you know that i work at Ulta and ive gotten to word to the tarte girls that you love love love their products. so hopefully you will be hearing from them ^_^ i hope you do cause i love your reviews! aw thanks jessica that’s very sweet of you! I’ve been in contact with them and they are very helpful and keep me up to date on new collections, etc but thank you so much, I appreciate your sharing your love of Musings with brands, that’s a huge compliment!!!!!!!!!!!!!!!!!!!!!!!!! !